Mince pies, Baileys, Quality Streets – they can all be found at the top of my shopping list this time of year. Eating, drinking and spending time with family and friends is what Christmas is all about in our household. That’s why it’s so difficult to stay fit over Christmas. In fact, it’s an absolute nightmare. I don’t know about you, but over Christmas I tend to write off the diet and exercise altogether. I tell myself, “It’s OK to indulge because that’s what New Year’s resolutions are for!” But where did this mind set come from? Biologically, it is better to make some attempt at keeping fit than to give up entirely. That’s what this blog is all about. For the first time (ever), I have decided to sit down and come up with three really practical ways of keeping fit without ruining Christmas. 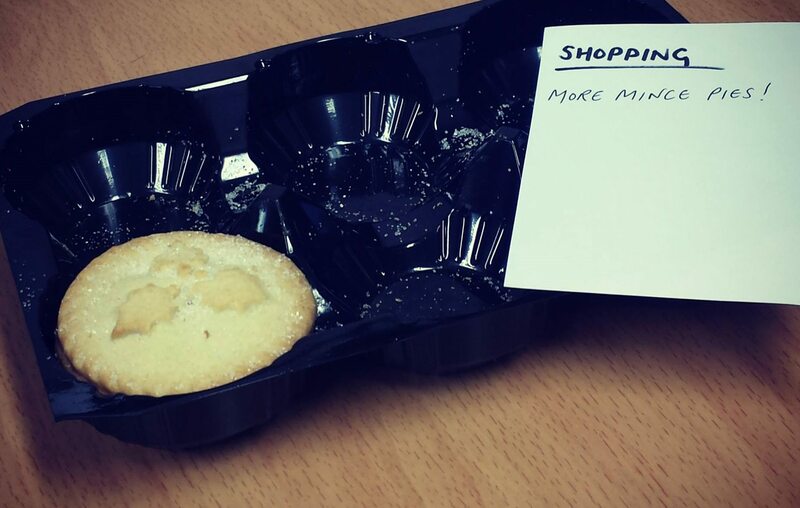 Eat mince pies. It’s absolutely fine to treat yourself once in a while. Cutting out anything sugary or calorific from your diet can be a sure-fire way to set you up to fail. It’s well known that if you start strictly banning treats, you’ll psychologically crave them more. Just try giving up chocolate – I’ll bet you’ll fancy a Mars Bar three times as much as you did beforehand. If we actively try to stay away from certain foods, sometimes our cravings can take over and we have a quick taste (especially when we’re surrounded by treats at Christmas). It’s here that we are more likely to slip up out of guilt, thinking “well, I’ve done it now. The diet is ruined. I’ll just eat 10 more.” Basically, have your favourite festive treat but have it in moderation. Allow yourself a mince pie with a brew and enjoy it – just don’t eat the whole packet. Do less in the gym. Doing less is a lot better than doing none. If you’re a regular gym-goer, don’t stop now. Yes, you have less free-time and, yes, it definitely gets harder to get in to the gym. But don’t beat yourself up if you can’t make your usual 3 or 4 sessions a week. This, unfortunately, has to be my biggest downfall. Every December I look over my diary and conclude that I can only squeeze in 1 class per week. Therefore, I decide to give up entirely and just re-start in January. If I can only make 1 session a week, then I should stick to that and be proud of my achievement. An hour session in the gym is better than an hour sat in front of the TV with a box of Heroes and a glass of wine and a bag of Malteasers and a mug of hot chocolate and a generous portion of trifle … (you get the picture). Make sure you have plenty of food. It’s all about eating lots of smaller meals and trying to eat the right things. If you’re a calorie counter, you might be tempted to miss out meals altogether especially if you’re saving yourself for a big feast later on in the day. In theory, it should work. But the truth is, it really doesn’t work at all. Skipping meals can interfere with your metabolism and can cause you to overindulge when you finally get presented with some food. Eating small meals throughout the day is the best way to keep your gut satisfied and your metabolism ticking over. Oh, and if you’ve had some food before you head out for your Christmas parties, you’ll be less likely to tuck into all the defrosted, high-calorie, high-sugar rubbish they serve up at the buffet!